Parkinson's disease (PD) affects 1 million people in the U.S. annually and there is no known cure. Can connections between the gut microbiome, the appendix, and the pathology of PD provide fresh therapeutic options? Primary treatments and research areas for PD historically revolved around drugs that increase the levels of dopamine in the synaptic space (Levodopa, Lodosyn, Duopa), medications that act as dopamine agonists (Mirapex, Requip, Neupro, Apokyn), and others that prevent enzymes from degrading dopamine (MAO B inhibitors, COMT inhibitors)1. However, new research indicates that altering the composition of the microbiome in conjunction with anti-inflammatory drugs may lessen neurodegenerative disease symptoms. Recent studies in the last few years have demonstrated that changing the gut microbiota has noticeable effects on the brain. Of particular interest is the protein α-synuclein, a key component of the development of PD which is found in both the appendix and the brain. PD is a neurodegenerative disorder characterized by the slow development of tremors, rigidity, and dementia, and has been referenced in various medical writings since 1817. While the exact cause is not known, new research has shed some light on potential causes of this condition. Typically PD begins to show symptoms around age fifty and is statistically more common in men than women. Roughly 60,000 people are diagnosed with the condition each year in the U.S. and there are no treatments for the disease, simply medication to ease the symptoms2. In those affected, the neurodegenerative symptoms are thought to be caused by protein buildup into Lewy bodies, slowly leading to neural cell death. These Lewy bodies can be imaged by magnetic resonance imaging (MRI) and appear as white matter lesions throughout the brain3. Comprising these deposits is the presynaptic protein α-synuclein (αS) in a misfolded form. In this conformation, the protein is soluble and assembles into toxic protofibrils. Protofibrils have been shown to contribute to neuronal cell death by disrupting synaptic functions and intracellular homeostasis4. Dr. Heiko Braak, from the University of Ulm in Germany, first hypothesized a gastrointestinal-brain connection in PD in 2006. After studying post-mortem appendix samples from patients with PD, Braak found high levels of Lewy bodies in the appendix which were indistinguishable from those located in the brain5. The appendix, a finger-sized organ, is mainly known for its tendency to become inflamed and burst, thereby releasing bacteria into the abdominal cavity. This organ is located at the junction between the small and large intestines and historically was believed to have developed to maintain a homeostatic environment for gut flora. While the appendix is referred to as a vestigial organ — an organ that has lost its original function throughout evolution — current research has shown that the appendix can contain microbes as well as various forms of αS6. In addition to the work pioneered by Braak, a recent study analyzing 1.6 million patients determined that those who had an appendectomy — the removal of the appendix — had a lower risk of developing PD7. αS can exist in multiple folded forms and the appendix might provide an environment that promotes the misfolding and aggregation of these proteins. The research group leading this study also found that cleavage occurred when αS proteins were exposed to appendix tissue lysates, resulting in small protein oligomers more likely to assemble into protofibrils. With regards to a physical connection between the appendix and the brain, the bloodstream and vagus nerve are two proposed links that would allow for the transportation of the aggregated proteins. The vagus nerve is the longest nerve in the body and provides motor functionality to all organs, as well as several skeletal muscles. Additionally, this nerve innervates the esophagus, airways, heart, stomach, gastrointestinal tract, pancreas, liver, and spleen8. Ulusoy et al. have demonstrated in rodent models that αS fibers, injected into the brain, can traverse through the vagus nerve into the stomach and gastrointestinal tract9. The microbiome could contribute to the aggregation of αS, as well. Dr. Robert Friedland, from the University of Louisville, found that gastrointestinal bacteria produce proteins that promote the aggregation of the αS in mice. Specific proteins generated by bacteria can influence the folding of other co-located proteins. The resulting shape of these folded proteins promotes their aggregation in a manner similar to prions which cause neurodegenerative diseases10. This supports the research that patients predisposed to PD have unique microbiota and can alter the symptoms associated with the neurodegenerative disease. Transplantation of the microbiome from PD patients into mice predisposed the animals to develop motor symptoms associated with PD and increased the amounts of Lewy bodies present in the brain. 1. Mayo Clinic. Parkinson's disease - Diagnosis and treatment. 2. Parkinson's Foundation. Accessed: 14th November 2018. 4. Conway, K. A. et al. Acceleration of oligomerization, not fibrillization, is a shared property of both alpha-synuclein mutations linked to early-onset Parkinson's disease: implications for pathogenesis and therapy. Proc. Natl. Acad. Sci. U. S. A. 97, 571-6 (2000). 5. Braak, H., de Vos, R. A. I., Bohl, J. & Del Tredici, K. Gastric α-synuclein immunoreactive inclusions in Meissner's and Auerbach's plexuses in cases staged for Parkinson's disease-related brain pathology. Neurosci. Lett. 396, 67-72 (2006). 6. Punsoni, M. et al. Enteric Pathologic Manifestations of Alpha-Synucleinopathies. Appl. Immunohistochem. Mol. Morphol. 1 (2017). doi:10.1097/PAI.0000000000000613. 7. Killinger, B. A. et al. 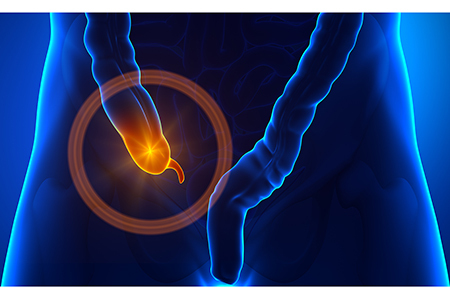 Parkinson's Disease: The vermiform appendix impacts the risk of developing Parkinson's disease. Sci. Transl. Med. 10, 31 (2018). 8. Berthoud, H.-R. & Neuhuber, W. L. Functional and chemical anatomy of the afferent vagal system. Auton. Neurosci. 85, 1-17 (2000). 9. Ulusoy, A. et al. Brain-to-stomach transfer of α-synuclein via vagal preganglionic projections. Acta Neuropathol. 133, 381-393 (2017). 10. Friedland, R. et al. The Influence of Bacterial Amyloid on Alpha Synuclein (AS) Misfolding in the Rat (P4.334). Neurology 86, (2016).